Regardless of the type of diet regime one is following, numerous people find that they crave for the occasional dessert or sweet-tasting food. Unfortunately, sugar and sweets are among the unhealthiest foods to consume; especially if one is on a ketogenic diet. A ketogenic diet is a low-carbohydrate, high-fat diet, with low to moderate proteins. The diet aims to create a glucose deficit in the body, allowing the liver to produce ketones as fuel for metabolism. 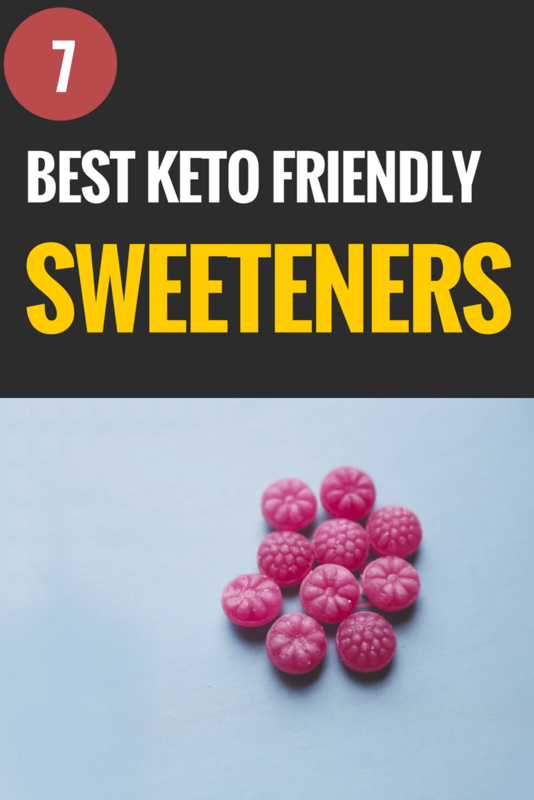 Therefore, it is crucial to understand healthier keto-friendly sweetener alternatives for those moments when one needs the occasional treat. This article looks into low-impact keto-friendly sweeteners for those on a ketogenic diet. Stevia leaf extract has been recommended as a zero-calorie sweetener for decades. The plant originates from native South America and is often documented as among the prominent sweeteners. It is also used as for treatment of gastrointestinal problems, skin problems, and arthritis. The commonly praised benefits of stevia on health include its ability to regulate blood sugars and progressively reduce insulin levels. Due to the high-intensity sweet taste, minute amounts of stevia extract, are often required to sweeten food to the same level as sugar would. Most importantly, as opposed to sugar, stevia is exempt of calories that are found in sugar. Stevia is also remarkably low in calories, hence its classification in the ‘zero-calorie’ food group. This means that one can enjoy a treat of cake or cookies made with stevia without being concerned about consuming calories. As ketogenic diets are crucial in regulating the amount of calories burnt daily, it would be imperative to decrease calorie intake by reducing sugar intake. Additionally, another benefit of Ketogenic diets is that they help lower the cholesterol levels. Studies have shown that stevia is beneficial in the reduction of low-density lipoproteins, also known as the bad cholesterol. Such actions help create a healthy lipid profile which helps maintain a healthy heart and cardiovascular system. It is advisable to purchase liquid-based stevia, which is powdered stevia dissolved in t-solution that keeps it pure. Powdered stevia is often mixed with artificial sweeteners that contain hidden carbohydrates which have the potential to increase the carbohydrate intake. The monk fruit, also known as Lo Han, is a sub-tropical melon-like fruit native to South East Asia. This fruit has been used for hundreds of years, and is gradually making its way into the health wellness arena for a reason; it is a natural sweetener, with zero-calories, and does not raise blood glucose and insulin levels. Monk-fruit extract is obtained from dried fruit and is 300 times sweeter than normal sugar. It is an excellent alternative for sugar for ketogenic diet enthusiasts not only because of its low-calorie content but also because of its significant nutritive value. Monk fruit contains mogrosides which give it its characteristic sweetness. When extracted, the Keto-friendly sugars invoke a blood-sugar stabilizing effect. Additionally, monk fruit contains triterpenes, flavonoids, and amino acids. Other studied health benefits of monk fruits are their ability to boost immunity as well as the antimicrobial properties. Consequently, the combined health benefits of monk fruit have been cited as crucial for diabetics and for people who are on a low carbohydrate diet. 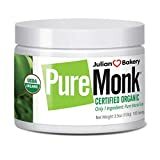 However, one should be extremely cautious when purchasing sweeteners that claim to be pure, as it is difficult to isolate the monk fruit sweetener component. 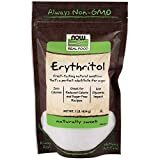 Erythritol is a sugar alcohol extracted from corn and is typically found in fruits and vegetables. The manufacturing process of the sweetener involves fermentation of glucose and sucrose. Erythritol and is approved by the Food and Drug Administration agency as a food additive. The sugar is a zero-calorie sweetener which makes it ideal for inclusion in sweet treats for individuals on a ketogenic diet. Unlike stevia, erythritol is only 80% as sweet as sugar, making it a lower intensity sweetener. Studies have shown that the compound does not alter blood glucose levels and insulin in healthy people. Additionally, because bacteria in the mouth do not feed on it, it helps mitigate tooth decay when used as an alternative to normal sugar. Some people, however, cite experiencing stomach discomfort after erythritol consumption. It is postulated that the discomfort arises due to the presence of alcohol molecules that cannot be digested in the human body; primarily because the human body lacks the enzyme that breaks alcohol down. It is, therefore, advisable to consume erythritol in moderation. 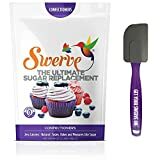 Swerve is an artificial sweetener manufactured from a blend of erythritol and inulin, an oligosaccharide. Due to the fermentation aspect in the manufacturing process, swerve is a sugar alcohol with minimal calories. It is widely used in the commercial food industry to manufacture “sugar-free food” such as candy, cookies, or low carbohydrate drinks. One serving of swerve, one teaspoon, is equivalent to 4 grams. Servings of more than one teaspoon are likely to increase calorie intake. Any serving containing more than 5 grams is not considered to be in the Food Drug Administration’s tier of zero-calorie foods. However, the body does not metabolize such carbohydrates due to the presence of erythritol. This makes swerve an appropriate component for ketogenic diets because it does not raise the glycemic index or blood glucose levels, thus, stabilizing insulin levels. Further, a ketogenic diet is associated with a mineral and electrolyte imbalance, commonly known as the ‘Keto-flu’. This imbalance often occurs as a result of the low carbohydrate intake which results in deficiencies in both magnesium and potassium. The yacon syrup contains high levels of potassium which ultimately helps in replenishing stores of the vital minerals. There are a few known side effects of yacon syrup. Consuming the syrup can lead to stomach discomfort; especially when consumed in large quantities, due to its laxative nature. Yacon syrup also contains free fructose molecules, about 35%, and hence, should be consumed in relatively moderate quantities. Tagatose is produced from lactose from whey in cow’s milk. It has 1.5 calories per gram and is, therefore, considered a low-calorie sweetener. Although it has a low glycemic index of 3, only about twenty percent of tagatose is absorbed in the small intestines. It is preferred for use as an alternative for normal sugar because of its low glycemic index and low- calorie count. It also has a neutral, sweet taste that can be described as ‘clean’ and is about eighty percent as sweet as sucrose. Additionally, tagatose is an excellent probiotic as it provides nutrition for the good bacteria in the gut, thus promoting general body health. High intake of tagatose is, however, discouraged as it has been shown to cause mild digestive complications. Also, it may not be appropriate for vegans because it is derived from cow milk making it an animal product. Mannitol is a semi-artificially produced sweetener commonly utilized as a food additive. The sugar is naturally found in strawberries, mushrooms, seaweeds, onions, and pumpkins. It is a low-calorie sweetener with about 1.6 calories per gram and has around 60% sweetness relative to normal sugar. This sugar is ideal for ketogenic diets as it has a zero glycemic index, meaning it does not raise blood sugar levels. It is also poorly absorbed in the small intestines but utilized by good bacteria in the colon, thus, promoting gut health. In conclusion, when one indulges their sweet tooth, especially individuals on ketogenic diets, it is imperative to utilize sweeteners with a zero-calorie effect. Such sweeteners can be obtained from natural sources such as stevia, yacon syrup, and monk fruit, or from other sources including erythritol, swerve, mannitol, and tagatose. For individuals adhering to ketogenic diets, sugary and starchy foods can be very difficult to avoid. It is in such circumstances that keto-friendly sweeteners play their role. There are, however, alternative sweeteners that do not increase blood glucose such as those discussed in the article. A word of caution is that it is imperative to look out for hidden sugars in ingredients. Most food and nutrition labels often indicate the sugars used in foods. Some foods could be labeled sugar-free but have sweeteners that contain sucrose; such components evoke a counterproductive effect in any Ketogenic diet.